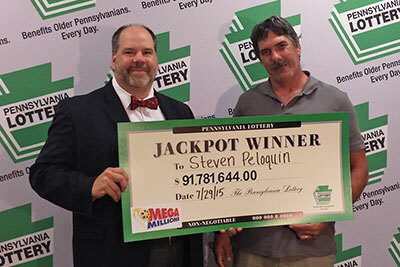 Steven Peloquin is a truck driver, he often gets a nice paycheck but it would take more than a lifetime before he would earn the amount he won with Mega Millions while passing through Pennsylvania. He stopped in Northumberland Country, Pennsylvania at Pen 80/Flying J Plaza at the beginning of July to buy a Mega Millions ticket. On July 21, his numbers matched every winning number and after taxes were taken he received 91.8 million. It was a few days after the drawing before Steven realized that he had won after he checked his ticket. As he was getting ready for bed last Saturday, July 25th, he decided to check on the internet the numbers he had bought. He had won! He did not shut his eyes a wink that night he reported to officials of the lottery. Peloquin has worked as a truck driver for the past 30 years but now he can retire earlier and definitely spend more time with his wife and family.